Still, it really is special. Much more impressive than certain houses on posh roads in Ballsbridge. agree with you Homeboy - kind of house that young kids would love - almost fairytale-like ? My cat would love those curtains. 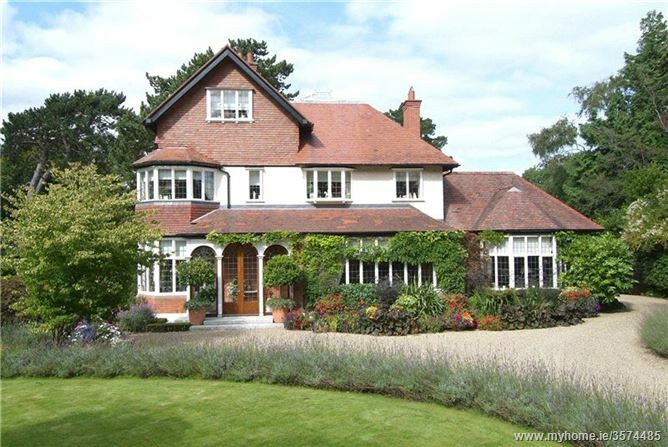 Love the house and I’m no expert on Foxrock but should this house not be priced closer to 2m? I completely missed that ! It’s like one of those ‘magic eye’ posters - only after looking at it for a long time do you see what it’s meant to be. Still, something very endearing about the outside of this house but perhaps will always be for a ‘niche’ buyer ? I think this house has been for sale for at least three years (if not longer) ? Cooldrinagh looks very beautiful and the gardens also look very beautiful. Kerrymount is also a very nice road. The nearby M50 and its exits into Foxrock, have changed the character of this area considerably in my view. I have the feeling that Foxrock prices have fallen behind Monkstown / Dalkey / Killiney prices, over the past few years. There have only been 2-3 sales over 3m since 2010 (Killiney has had at least 6). The internals of the house seem a bit unusual - 3 bedrooms for a 4,000 sq ft. house ? It will be additional cost to re-structure this to modern affluent living. I suspect, given the history, that this is a heavily listed house, and therefore such re-structuring might not be straightforward. Also a pity that the historical back garden of the house seems to have been sold off for another development and thus the house is stuck into a corner of the site. Would have been lovely when it sat right in the middle of a larger c. 1.5 acre site. The asking of 4.25m is nowhere near realistic. The benchmark is Stanford House on nearby Westminister Road (almost equally good road to Kerrymount), which went for 3m (1.5 acres + 4,000 sq ft.) at the end of 2014. Even 3m would be a push for Cooldrinagh. Can’t understand the pricing of this house and why, given the high level, they have kept it advertised for so long. Usually when a seller has very strong expectations of price, it is left off-market to be only introduced to the ‘right buyers’. This strategy does not make sense to me. I actually wonder if this house is really for sale (in the normal sense of a willing seller)? The asking of 4.25m is nowhere near realistic. Something so out of the price region smacks of an owner trying to clear a mortgage. I often wonder why they bother. Surly even the vendors know this price is not achievable. I would be surprised if there is a mortgage. That could be it mr_anderson, however it was asking less money in 2013 (and Sherry Fitz seem to always have been the agent) ? I have seen houses that are advertised for sale but are not really for sale (in the normal sense of wanting get a deal done). a. This can be in a separation (one of them is not a willing seller and drags it out by always asking too much). b. It can also come from an older owner happy to accept the publicity of selling, in the hope of landing a crazy number (it happens). c. Or it can be a bank forcing a house to be put on sale, but the owners, asking so much, it never sells (and the EA backing them up). I can just imagine the price fluctuating in real-time as the vendors fight with one another. €3,500,000 - 3 Bed Detached House 380.9 m² / 4100 ft² For Sale (c. 1 acre). Its is back, again. God above, somebody please buy this. It would help if the asking was at least a more credible 3m. I don’t know- if I owned this and I saw that someone had forked out €2.75m for Mangerton then I’d consider my asking price of €3.5m to be realistic - it’s a bigger site, better house, better road, etc., etc I think the real question on this one is whether it’s really for sale or not? They’ve been messing around for years now- I don’t know how any buyer could consider them credible sellers at this stage, they seem to be total time wasters with their raising and dropping prices, pulling it off the market and back on a few months later. It’s a joke. When the Mangerton buyer sees Windermere’s and Hillside’s sale price, they will realise how much they overpaid. (paying the Sherry Fitzgerald asking price, in Co. Dublin at the high-end (i.e. outside city), is asking to be screwed). This must be an Irish bank and its Irish owner, who is giving them the run around (for years now). (the non-Irish banks would have stopped this long time ago, and gone to auction for best bids). Eventually even the Irish bank will get tired of this game. The agent will eventually be changed (probably DNG), and it will get sold in a few months for between 2.7-3.1m. (we had another example of this a few months ago on 70 Ailesbury Road, also with DNG vs. SF). SF are a little more prone to “going native” with the Irish owner, for Dublin high-end (as some funds are finding out).